Hello Autumn! Cool crisp air and time to layer up and wrap yourself in your favorite sweaters. It is with this in mind that I designed Stratham for Harrisville Designs. Lately I’ve been fascinated by changing patterns, and I’m really excited about this design. 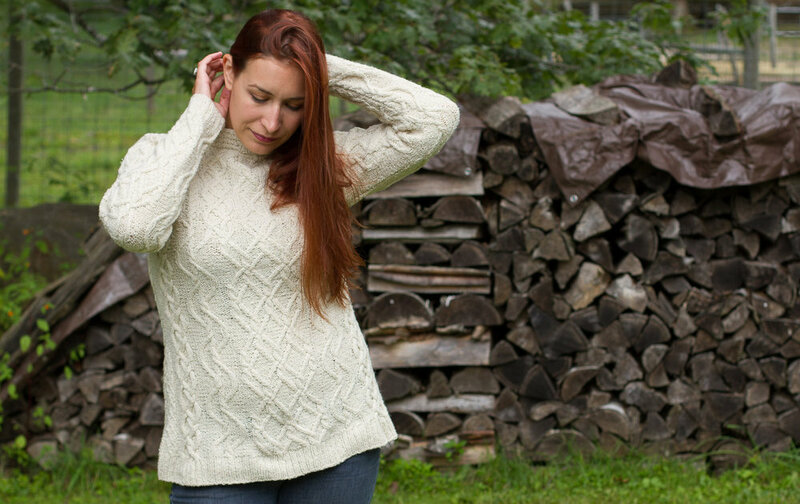 The pattern is reminiscent of Celtic cabled sweaters, but with an updated aesthetic. The defining characteristic is the way the cables morph and merge as they climb up the body of the sweater. The long length and slight A-line shape make it perfect for just pulling on over a pair of jeans or leggings and off you go. There was quite a lot of swatching and charting work in creating a cohesive transition as the cables morph and change, and the end result is a very pleasing and interesting twist on classic design. Although this design may look complicated, once you get the pattern established it works up quickly. Everything is charted, so you can easily keep track of where you are in the patterns. Another tip to make this work up quickly is to use the “no cable needle” method for crossing cables. Working with Harrisville Designs Silk & Wool was a joy. The yarn creates great stitch definition and the silk and wool combination create both warmth and drape. Although the sample sweater is done in a very neutral color, Harrisville offers many great options, and an vibrant color such as Veronica or Peach would create a stunning look. You can get the pattern on Harrisville Designs Ravelry page.